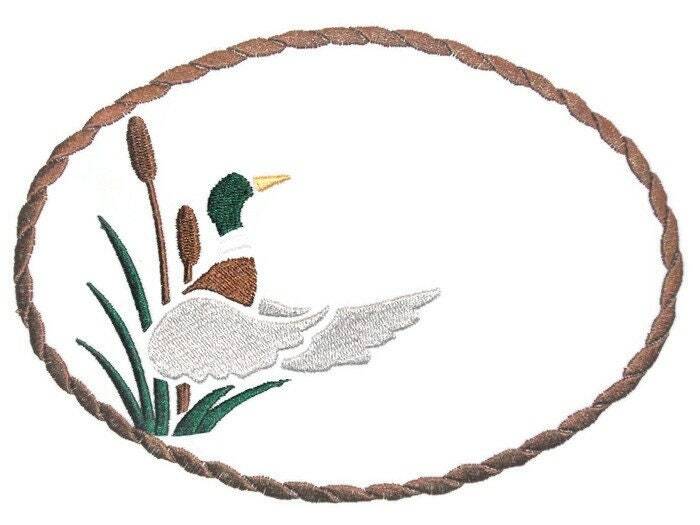 Mallard duck embroidered quilt label. Customize the label with your personal message. Document you quilts history in style with an embroidered quilt label with a professional finish. Measures: 18cm x 13cm (7" x 5"). This label will add the finishing touch to your quilted heirloom. It will be stitched onto white high quality quilt cotton. Please email or include your choice with your payment. Your are welcome to change any part of the quilt label, ie; size, colour. Or if you do not see the style you need, I can design you a label on request. If you prefer a different background, send me an email with your request, as my supply of different coloured cotton may change over time. If you do not find a quilt label to compliment your quilt, I can create one on request. How many characters can be added to a quilt label? I can stitch approximately 15-20 characters per line, with 3-5 lines. Can I change any part of the quilt label? - Any part of the thread colour within the design. - Add an additional element to the design. (ie) add a ❤ into the text next to Love Mom. "Love ❤ Mom"
Can I have embroidered lines to write on the label myself instead of script. Yes, I can add 4 lines into the text area for you. Just add a comment with your purchase. Labels can be made smaller but, I cannot make text smaller due to the way text stitches out. On request, I can adjust the size as far as the text size limit. Adding a personal message to your quilt label is included with your purchase. Most labels fit approximately 3-4 lines with 15-20 characters per line.